Ice cream has certainly been having its moment, wherever you look in London there are wonderfully creamy gelatos and ice creams being beautifully executed by creative artisans. Handmade, moreish, ice cold tantalising scoops being handed out from pop-ups, street venders and markets. And it is not just in the specialist stores that you can find such wonders, you can pick up really good stuff from the supermarket. Such exciting flavours and every sort that you could possibly imagine from your classic custard based ice cream to yoghurt based or vegan varieties. All completely different from when we were kids where the Neoplitan (striped vanilla, chocolate and strawberry) was as exciting as it got. If we had to pick our favourite five in London it would probably be as follows La Gelatiera (the basil and chilli, and the salted caramel), Chin Chin Labs (burnt butter caramel), Gelupo (), Ruby Violet and our local – Marine Ices in chalk farm (white chocolate). I can’t think of a more thrilling job than coming up with new ice cream flavours – can you imagine! But hey ho the grass is always greener. 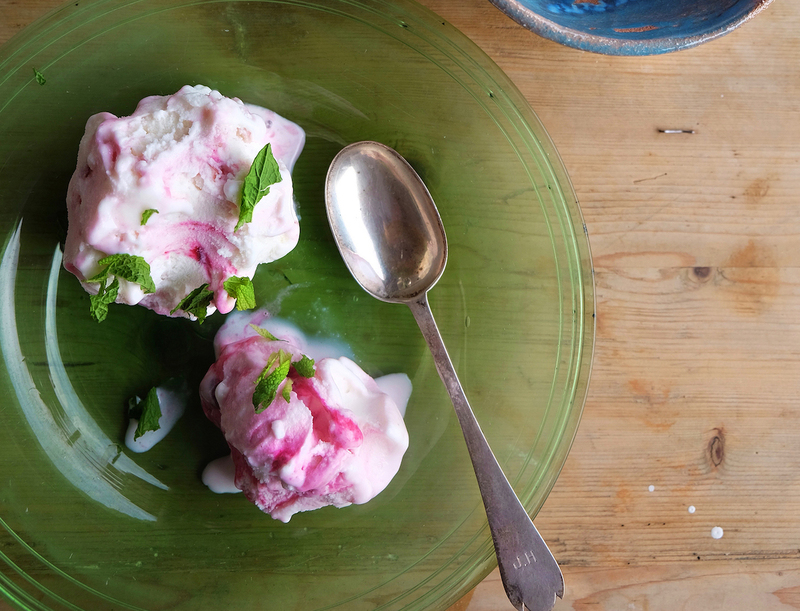 There are good recipes for no churn ice cream which means making it at home a doddle for anyone to do, however we can’t help feeling that it’s a bit of a bore. If possible an investment into an ice cream maker is a game changer. You can pick up the ones that you start by putting the bowl in the freezer pretty cheaply, then there are the all-in-one ice cream makers which are more expensive. Whichever device you go for means that you can make a homemade ice cream in about 15 minutes, then leave the rest up to the machine. We are always impressed when someone serves homemade ice cream at a dinner party, and how ideal that it can be made weeks in advance. After you have mastered the base, which is very easy then all you have to do is add your flavour, and be as adventurous as you like. The only ice creams we have found that do not work are those with too high water content which makes that icy texture and will make them rock hard rather than the soft, smooth cream. You can cheat slightly here by adding alcohol, starch, protein (egg or milk), or even a couple of table spoons of glycose does the trick. Another good tip is that you can infuse the cream before hand, this works well with herbs as they don’t freeze well and you end up finding little bits of basil lets say stuck in your teeth, instead heat the cream gently for half an hour with the basil then discard and you will have a basil tasting cream. 1. Preheat oven to 200*. When hot add a tray of your cashews, leave to roast for 8 mins. Take out, when cooled, add to your blender and blitz until a smooth butter, up to 10 minutes 2. Add the remaining ingredients and blitz until smooth. Or (matter of preference) leave the raspberries to one side and blitz separately, to be added later to your ice cream to make a ripple (like we have done in the picture). 3. Pour into your ice cream maker and follow instructions. If you have left your raspberry separately, then pour in at the last moment to create the desired ripple effect.